Always one for the grand gesture, outgoing Defense Minister Panos Kammenos, decided to use the ministerial Huey helicopter – which he mistakenly calls HU1 instead of UH-1 in his Tweet – to fly over the Imia islets, site of a 1996 incident between Greece and Turkey that brought the to countries to the brink of war. Turkey, which disputed the sovereignty of the uninhabited islets, managed to land, undetected, a contingent of special forces on one of them on the night of 27/28 January 1996. A Greek helicopter sent to investigate crashed – the reason remains unknown or not divulged - and the three naval aviators in it, Christodoulos Karathanasis, Panagiotis Vlahakos, and Ektoras Gialopsos, were killed. Further escalation was averted through US intervention. 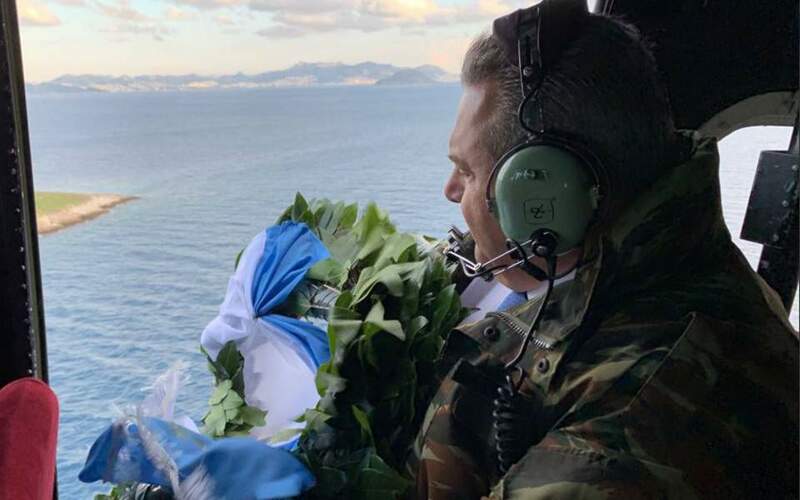 Overflying the islets, Kammenos threw a wreath into the sea in memory of the three aviators. His passage at the Defense Ministry had begun with a similar gesture in January 2015. Kammenos tweeted, in Greek: "Final Act...where the journey begun. Imia, now. Honor to the heroes Vlahakos, Karathanassis, Gialopsos and all who died for faith and fatherland, the nation bows. I thank my aides de camp, pilot Col. Philippou and the crew of HU1 for all these years."